People are like an encyclopedia, filled with information but not often opened. I opened one human encyclopedia once after a chance encounter in an elevator led me on a trip to the Azores. But I guess I should start at the beginning. Guida Ponte is a wonderful person I met on the NBC “Today Show” several years ago. She was born in the Azores islands and came to America to fulfill her dream of becoming a top chef. That she did when she became corporate chef for Legal Sea Foods, a wonderful chain of seafood restaurants in Boston. For a big show like the NBC “Today Show,” there is a rehearsal the night before for segments that have props in them. I had just finished my rehearsal and was heading for the elevator when a group who had also been at the show rehearsals for their seafood segment met me. Legal Sea Foods was to be featured on the show the next morning. As we rode down in the elevator, the group asked me if I would like to join them for a late New York dinner. When it comes to meeting and getting to know new people, I am always game. I do not remember the meal for where we went, but that night I met an incredible woman who dreamed a dream of coming to America and now was busy at work making her dream come true. I later met her in Boston and even went with her on a trip to her home country. Guida has a wealth of information, and through the years I have had the opportunity to learn so much from her. I am so glad that I was able to share and learn with her. From her I learned a recipe that I love to fix both indoors and out. It has never failed to be one of my favorites. Oil bottom of a lidded pot. 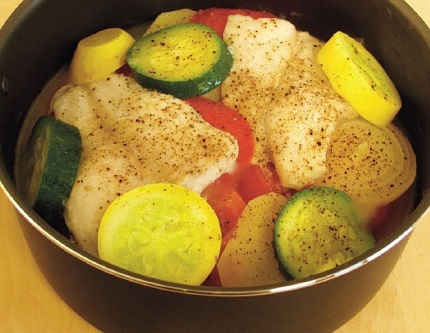 Layer one-half of each of the ingredients: onion, garlic, tomatoes, potato, fish, zucchini or yellow squash, salt, pepper, and water in the pot. Repeat in the same order with remaining ingredients. Simmer, covered, for 45 minutes. You will find many more healthy recipes in Dian’s healthy living book, Tipping the Scales in Your Favor. Permanent weight-loss is not a diet; it is a lifestyle change. There is no one "magic bullet." Instead, it's a matter of consistently incorporating a number of steps that include exercise, eating right and accountability. It's like leading a symphony: You've got to have all the instruments playing at the same time or you don't get the results. In Dian's new book, Tipping the Scales in Your Favor, she shares step-by-step what she did to lose more than 125 pounds and keep up an active lifestyle. The pages of the book come alive with practical tips, healthy recipes, more than 175 beautiful color illustrations, and her refreshing and honest story of the journey. For more info, go to www.DianThomas.com and check out the book on the right side of the page.